This course studied five great women writers working in Britain in the nineteenth and early twentieth centuries. We focused on one book per day, with lectures, discussions, and supervisions (tutorials) in the Cambridge style. Our teachers include leading Cambridge scholars Gillian Beer, Aoife Byrne, Alison Hennegan, Trudi Tate and Clare Walker Gore. 'We think back through our mothers, if we are women', wrote Virginia Woolf in A Room of One's Own (1929). But is this always true? Woolf herself read deeply and widely across all of English literature, and by no means restricted herself to writing by women. But she, like other major women writers of the 19th and early 20th centuries, perhaps enabled more women to take themselves seriously as writers, and to commit themselves to the highest standards of literature. Is there a 'women's tradition' in English Literature – a literature of one's own? Are these helpful ways of thinking about writing by women, or is it better to consider women, like men, in their full cultural and historical context? We explored these and many other questions through five major works by women writers. They are all wonderful books in their very different ways, and they raise questions and ideas which remain relevant to everyone, women and men, writers and readers, right up to the present day. We had some wonderful visits to places of interest around Cambridge. We went to Girton College, established in 1869, the first residential university college for women. Clare Walker Gore talked about George Eliot’s support for women’s education, and Alison Hennegan told us some of the remarkable history of Girton. The talks were held in the Reception Room, where Woolf gave a talk in 1928 on 'Women and Fiction', which became A Room of One's Own (1929). Part of Clare's talk is on our Blog page. We visited the Wren Library at Trinity College to see some of its manuscripts – Milton’s ‘Lycidas’; letters from Charlotte Bronte, George Eliot, and others; many first editions of classic works; not to mention the manuscript of Winnie the Pooh. And we had a traditional afternoon tea at the Orchard Tearoom in Grantchester, sitting under the apple trees. Clare Walker Gore's thoughts on George Eliot, The Mill on the Floss, on our Blog page. Claire Davison's thoughts on Katherine Mansfield and music on our Blog page. Lucy Delap: brief comments on the Cambridge women's colleges and the women's suffrage movement. Click for gallery of images from our 2017 summer course. Read an account of the 2018 Women Writers course by Julia Salmeron of Madrid. Read accounts of studying in Cambridge by PhD student Selin Kalostyan, and by Hans Grietens and Adam Chugg. Virginia Woolf lived through exciting, often turbulent times. This course explored how is the history of her own times is expressed in her writing. In her lifetime, women were newly able to study at university. Girton and Newnham Colleges were founded in Cambridge not long before she was born. Woolf was in her 30s during the First World War. She was 36 when the first women got the vote in Britain, in 1918. She wrote about the laws which opened up the professions to women. She was closely engaged with people active in the Labour Party in the 1920s and 30s (including her husband, Leonard Woolf), and followed current events closely in the newspapers. She was a deeply committed anti-fascist, even as she wondered about the best way to oppose fascist thinking and behaviour. Her great work Three Guineas (1938) is both anti-fascist and a complex argument against war. The course looked at her experiences as activist, ambivalent commentator, and observer, and finished with her satiric look at gender in Orlando. 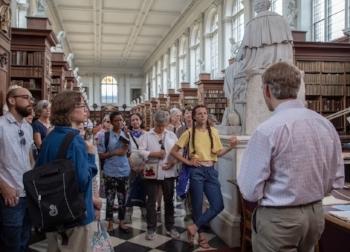 • We visited King's College with King's Fellow Peter Jones, to see parts of the college of interest to Woolf, including the chapel where she enjoyed the music. We were able to visit many parts of the college not normally open to visitors. More on our Blog pages. • We went to the Wren Library at Trinity, mockingly cursed by Woolf in A Room of One's Own, and now much used by women scholars and students. It was fascinating to see letters from Virginia and Leonard Woolf, first editions of her work, as well as a display about the suffrage struggle. • We enjoyed the rare opportunity to see the manuscript of A Room of One's Own at the Fitzwilliam Museum (not to mention the slap-up tea at Fitzbillies afterwards). See Blog pages for images. Link: Lizzie Hammond writes about her experiences on this course. The theme for our 2017 Virginia Woolf Summer Course was Woolf's Rooms. We had an amazing week of intensive lectures, supervisions, discussions, and readings. We paid visits to Girton and Newnham Colleges, and heard about the talks Woolf gave there. These talks were then revised to become A Room of One's Own (1929), one of Woolf's most influential books. It was moving to sit in the very rooms in which Woolf spoke to young women undergraduates in 1928. We also went to King's College and to the Fitzwilliam Museum, where we were privileged to see the original manuscript of A Room of One's Own. Further details of the week can be found on our Facebook page. Sincere thanks to our inspiring teachers, and to our wonderful, enthusiatic students of all ages, from all over the world, who made this such a memorable week. Why are rooms so important in the writing of Virginia Woolf? Who needs a room of their own, and why? The use of space was, and remains, a political issue. Who has space; how is it used; how is it shared (or not)? What is the relationship between rooms and creativity; rooms and power? The course explored these and many other questions through five key books by Woolf, listed below. Our speakers included leading scholars Gillian Beer, Sinead Garrigan Mattar, Alison Hennegan, Claire Nicholson, Jane Potter, and Trudi Tate. Some evenings we had readings and talks, including a talk by Kabe Wilson on his remarkable re-writing of A Room of One's Own. Interview with Kabe Wilson here; article here. 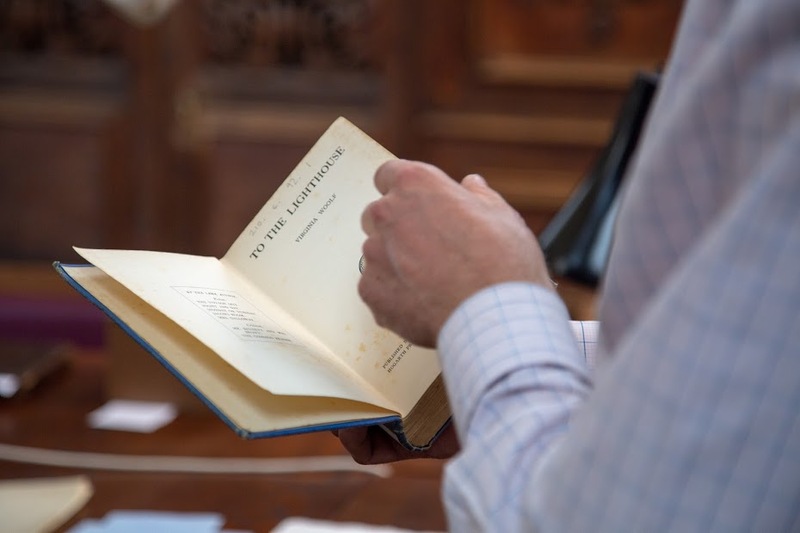 Reading Bloomsbury explored some of the literature, art, and ideas developed by a lively group of intellectuals, many with strong Cambridge connections, who lived in Bloomsbury in London from about 1904. The course offered itself as an antidote to some current views of Bloomsbury; we focused on the work and ideas (rather than the love affairs) of these very interesting people, from whom we can still learn a great deal. The loose grouping of people around Virginia and Leonard Woolf, Vanessa Bell, John Maynard Keynes, Roger Fry, Lytton Strachey, E. M. Forster, and others, were serious writers, artists, and thinkers. They were people who engaged seriously with the pressing political and social issues of the day, focusing on the 1910s to 1930s. We explored their thinking on some of the most important issues of the period, such as the First World War and the peace settlements, international relations, the franchise, the problems of an unreliable press, rights for women, freedom from sexual repression, the emergence of fascism. E. M. Forster, 'What I Believe' (1939). Online edition. Ian Sansom article in the Guardian on Bloomsbury (2011). Susanna Rustin article in the Guardian on Bloomsbury (2015). Extract from Glendinning biography of Leonard Woolf in the Guardian (2006). Paul Levy review of Glendinning's biography of Leonard Woolf (2006). Paul Levy on Lytton Strachey in the Guardian (2002). Art UK on Vanessa Bell. Art UK on Dora Carrington. Art UK on Roger Fry. For students' comments on this course, please see the Testimonials page. Our first course was Virginia Woolf in Cambridge, held in July 2016 in Homerton College, Cambridge. We started each day with a lecture and discussion by a leading Woolf scholar. We heard Alison Hennegan on A Room of One's Own, Susan Sellers on Mrs Dalloway, Trudi Tate on To the Lighthouse and Gillian Beer on Reading The Waves Across a Lifetime. We also looked at some of Woolf's essays, and deepened our knowledge of the context in which she wrote. We thought about Woolf's own education, which was mainly (not entirely) at home. She was extraordinarily well read and well informed. Much of her knowledge came through her own reading, much from intellectual discussions with others. At the same time, she recognised the value of formal education. We visited Girton and Newnham Colleges and sat in the very rooms in which Woolf gave the talks in 1928 which were to become A Room of One's Own. Most days we had what in Cambridge is called a supervision (in Oxford it is a tutorial). A small group of 2 or 3 students talks for an hour with an experienced Cambridge supervisor. 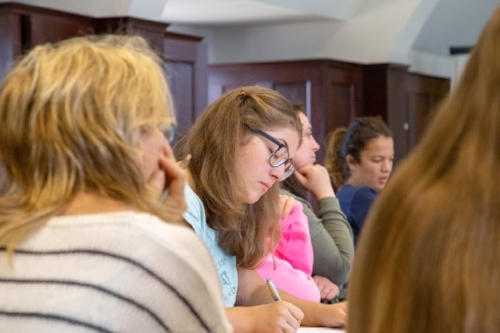 It is an opportunity for an open yet guided discussion, in which students explore ideas quite deeply, listen carefully to other people's thoughts, and develop their skills in reading a literary work in depth, and with precision. We had an excursion to the Orchard Tea Room in Grantchester and heard a talk by Claire Nicholson on Woolf's friendship with Rupert Brooke before the First World War, and we visited Bloomsbury in London, led by art historian Claudia Tobin. We enjoyed readings and talks by novelist Susan Sellers and performance artist Kabe Wilson. Throughout the week, students used their spare time to read, think, visit bookshops and colleges, discuss ideas with other students, and to reflect. One of our students, Adam Chugg, gives further thoughts on the course on our Blog. Another student, Beth Daugherty, has written an account for Blogging Woolf. For us, one of the most rewarding aspects of the course was the incredibly interesting group of people who came to Cambridge from many parts of the world. Woolf brought together readers who would never otherwise meet, and many strong friendships were formed. This summer course is one of my top experiences. The course is still resonating – I think it was the immersion. The course was a real inspiration. Terrific program. I am going to do my best to come back next year ... You did an exceptional job providing something for everyone, no matter their background. A big thank you. Thank you so much for this course. It was excellently run and has reinvigorated both my enthusiasm for the Cambridge way and, most importantly, for Woolf’s works. Very well organized, enthusiastic staff, diverse range of activities, wonderful location! Thanks for everything! Clear speakers whose enthusiasm is engaging and stimulating.